Seaweed Polysaccharides: Isolation, Biological, and Biomedical Applications examines the isolation and characterization of algal biopolymers, including a range of new biological and biomedical applications. In recent years, significant developments have been made in algae-based polymers (commonly called polysaccharides), and in biomedical applications such as drug delivery, wound dressings, and tissue engineering. Demand for algae-based polymers is increasing and represent a potential—very inexpensive—resource for these applications. The structure and chemical modification of algal polymers are covered, as well as the biological properties of these materials – including antithrombic, anti-inflammatory, anticoagulant, and antiviral aspects. Toxicity of algal biopolymers is also covered. Finally, the book introduces and explains real world applications of algal-based biopolymers in biomedical applications, including tissue engineering, drug delivery, and biosensors. 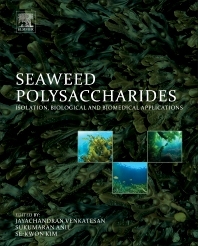 This is the first book to cover the extraction techniques, biomedical applications, and the economic perspective of seaweed polysaccharides. It is an essential text for researchers and industry professionals looking to work with this renewable resource. Materials scientists and engineers involved in the development of new materials for a range of biomedical applications. Dr. Jayachandran Venkatesan, M.Sc., M.Phil., Ph.D. is presently working as a postdoctoral researcher in Division of Bioengineering, Incheon National University, and Incheon, South Korea. Previously, he worked as a Research Professor at the Department of Chemistry and Marine Bioprocess Research Center (MBPRC) at Pukyong National University, Busan, South Korea. He received his Master of Science in chemistry from Thiruvalluvar University in 2005. Further, He received his Ph.D. from Pukyong National University in 2011. His major research interests are investigation and development of materials from marine sources. Furthermore, he is currently doing a research on biomaterials, tissue engineering and drug delivery application. To date, he has published 62 research papers and holds 4 patents. Prof. Sukumaran Anil, BDS, MDS, PhD, FDS RCPS (Glas), FICD, FPFA, is currently serving as professor and consultant in Division of Periodontics, College of Dentistry, Prince Sattam Bin Abdulaziz University, Riyadh and Saudi Arabia. He received his Doctoral Degree in Dentistry (PhD), from University of Hong Kong in 2002. Further, he underwent one year advanced training at the UK center for Oral HIV research, Guys’ and St. Thomas’s hospital, London. Based on the contribution to the field Prof. Sukumaran received honorary fellowship from the Royal College of Physicians and Surgeons, Glasgow (FDS, RCPS), International College of Dentist (FICD) and Pierre Fauchard Academy (FPFA). He was a recipient of several awards for excellence in the field, Gold-medal winner (BDS-India), Ratan H. Doctor National Award (INDIA), Wang Gungwu Scholarship for Research Students (Hong Kong), Golden Quill award for research excellence from King Saud University, Riyadh. He has more than 30 years of undergraduate, postgraduate teaching experience and PhD supervision in various countries such as India, Hong Kong, Saudi Arabia, United Kingdom, The Netherlands, South Korea and USA. Previously, he served as full Professor at King Saud University, Riyadh for the past 10 years and worked as chairman and member of the National Accreditation (NCAAA), European and US accreditation for the courses at King Saud University. He is having a major role in developing a medical research facility (Biomaterials and Dental) for the medical division of the ministry of defense in Riyadh. He has published more than 350 research papers in high-impact journals-chapters and books in the field. Prof. Se-Kwon Kim, Ph.D., is presently working as a Distinguished Professor at Department of Marine Bio Convergence Science and Technology and Director of Marine Bioprocess Research Center (MBPRC) at Pukyong National University, Busan, South Korea. He received his M.Sc. and Ph.D. degrees from Pukyong National University and conducted his postdoctoral studies at the Laboratory of Biochemical Engineering, University of Illinois, Urbana-Champaign, Illinois, USA. Later, he became a visiting scientist at the Memorial University of Newfoundland and University of British Colombia in Canada. Dr. Kim served as president of the ‘Korean Society of Chitin and Chitosan’ in 1986-1990, and the ‘Korean Society of Marine Biotechnology’ in 2006-2007. To the credit for his research, he won the best paper award from the American Oil Chemists’ Society In 2002. Dr. Kim was also the chairperson for ‘7th Asia-pacific Chitin and Chitosan Symposium’, which was held in South Korea in 2006. He was the chief-editor in the ‘Korean Society of Fisheries and Aquatic Science’ during 2008-2009. In addition, he is the board member of International Society of Marine Biotechnology (IMB) and International Society of Nutraceuticals and Functional Food (ISNFF). His major research interests are investigation and development of bioactive substances from marine resources. His immense experience of marine bioprocessing and mass-production technologies for marine bio-industry is the key asset of holding majorly funded Marine Bio projects in Korea. Furthermore, he expended his research fields up to the development of bioactive materials from marine organisms for their applications in oriental medicine, cosmeceuticals and nutraceuticals. To date, he has authored around 800 research papers, 70 books and holds 120 patents.